Biofuel is a word just about everybody has heard of. But getting the average person in the street to explain what it actually means is likely to lead to quizzical looks, shrugs of the shoulder, or remarks about not really being interested. However, describe the use of biofuels in terms of an actual example and you end up with a completely different reaction. In that respect, the burger chain McDonald’s is the perfect example. The company has for some time now turned its used cooking oil into biodiesel which is then used to run the company’s delivery fleet. Once fully rolled out, says McDonald’s, the carbon saving will be the equivalent of removing 2,424 family cars from the road. Impressive. But it’s not just in the United Kingdom where McDonald’s is making a difference as far as the environment is concerned. In the middle of 2011, the company rolled out the same scheme in United Arab Emirates (UAE). At the end of last year, McDonald’s UAE reported that its fleet had completed 808,411 miles on biodiesel and had reduced its truck-based carbon dioxide emissions by 80%. Again, an impressive effort by McDonald’s and its partner Neutral Fuels, and not forgetting the part played by the UAE, too. Seems whether it’s international trade in the UAE or helping to save the planet, this dynamic Persian Gulf state is always ready to do it’s bit. Meanwhile, back in the UK, McDonald’s efforts have been warmly welcomed by The Carbon Trust. In case you don’t know who they are, the Carbon Trust is a world-leading organisation helping businesses, governments and the public sector to accelerate the move to a low carbon economy through carbon reduction, energy-saving strategies and commercialising low carbon technologies. James Wilde, Director of Innovation and Policy at The Carbon Trust, says there is no silver bullet to solve the challenge of climate change. This means that low-carbon technologies will be required to significantly reduce carbon emissions. Many see this transformation as a cost to the economy, he argues, but responding to climate change represents a huge commercial business opportunity through the creation of new markets. Bioenergy has the potential to decarbonise electricity generation, heat and transport in the UK and globally. 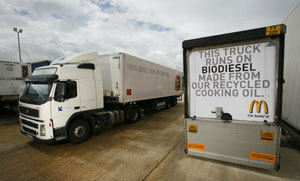 Mr Wilde says, “Liquid biofuels used for transport are particularly controversial. They appear to have as many dissenters as advocates. Advocates see a dispatchable renewable energy source, which can use existing infrastructure, can be domestically sourced, and could be used to generate low-carbon electricity when combined with Carbon Capture and Storage (CCS). “However, dissenters see an energy source that competes with food for agricultural land, creates emissions from land use change, generates air quality concerns and can impact negatively on biodiversity. The debate around bioenergy has moved on in recent years from “can this be done sustainably” to “how much of this can we deploy sustainably and equitably?”.